USB connectivity is just one of the many features that new cars, and aftermarket head units, often come with today that wasn't available just a few years ago. Some of these features are harder to crack than others, in terms of adding them to older head units without forking out for a costly upgrade, but there are actually two ways that USB can be added to an older car stereo without too much trouble. The easiest way to add USB to a car stereo is to connect an FM transmitter that has a built-in USB port, but there is also another way that offers much better sound quality if the head unit already has an auxiliary input. While USB seems like just another type of auxiliary input, there’s actually more going on under the hood than a lot of people realize. Normal auxiliary inputs require an analog signal from a device like a satellite radio, CD player or MP3 player, which is fine, but USB allows a device to offload digital audio data to a head unit and allow it to do the heavy lifting. This is why you can typically plug a USB thumbstick that contains songs, but no MP3 player hardware, into a USB head unit, and play music directly from the storage media. This is also why USB to aux cables don’t work the way that you might expect, or hope, that they would. If you plug the USB end into a device that is only capable of passively providing access to stored content via the USB connection, nothing comes out the other end. There are exceptions, like phones and MP3 players that can actually output an analog audio signal via their USB ports, but that isn’t terribly common and defeats the purpose of using a USB connection to hook up to a car stereo in the first place. The easiest way to add a USB connection to a car stereo is to simply use an FM transmitter that has a USB port. This is a truly plug-and-play solution that requires no installation work. All you have to do is plug the transmitter into power, connect your phone, MP3 player or USB stick to the transmitter, and tune your car radio to an empty space on the dial. In order to offer the same functionality as an actual USB car radio, it’s important to look for an FM transmitter that includes a built-in DAC and MP3 player. This will allow you to plug in a USB thumb drive if you so desire, in addition to using your phone or MP3 player. The main drawback in using an FM transmitter to add USB to a car stereo is quality and reliability. Some FM broadcasters offer decent audio fidelity, while others leave a lot to be desired, so it’s important to look for one that has a solid reputation. Even if you do go with an FM transmitter that offers high audio quality, you may still run into problems if you live in an area with a lot of strong FM radio signals. FM transmitters rely on finding a relatively empty spot on the radio dial, which is more or less impossible in some places. The other way to add USB to a car stereo is to use USB interface kit or an MP3 decoder board that includes a USB port, built-in DAC, and an auxiliary output. These devices are essentially just purpose-built MP3 players that you hardwire to power in your car, just like your head unit, and then wire to the head unit, either via an auxiliary input or some type of proprietary connection. USB interface kits in particularly are purposefully designed to add USB to a car stereo that didn’t come with that functionality. Depending on the kit that you find, it may have a proprietary connection to hook up to a very specific type of vehicle of a head unit, or it may simply include an aux output. MP3 decoder boards aren’t specifically designed for this purpose, but they can still be used to add USB to a car stereo so long as the board includes a USB input, an auxiliary output, and preferably runs on 12v DC. If the board is designed to run on a different power source, then installation is a little more complicated. Since the interface kit or decoder board is capable of playing MP3 files, you can hook up virtually any MP3 player, smartphone, or USB storage media, and play music directly from the device. The audio quality and reliability will typically be better than you would get from an FM transmitter since this type of solution uses a hard-wired connection that isn’t subject to radio interference. Depending on the quality of the DAC, you may even get better audio quality than you would by hooking your phone or MP3 player to the auxiliary input on the head unit. While it is possible to simulate the main functionality of a USB car stereo with an FM transmitter or a hard-wired MP3 decoder board, the ease of use may suffer. 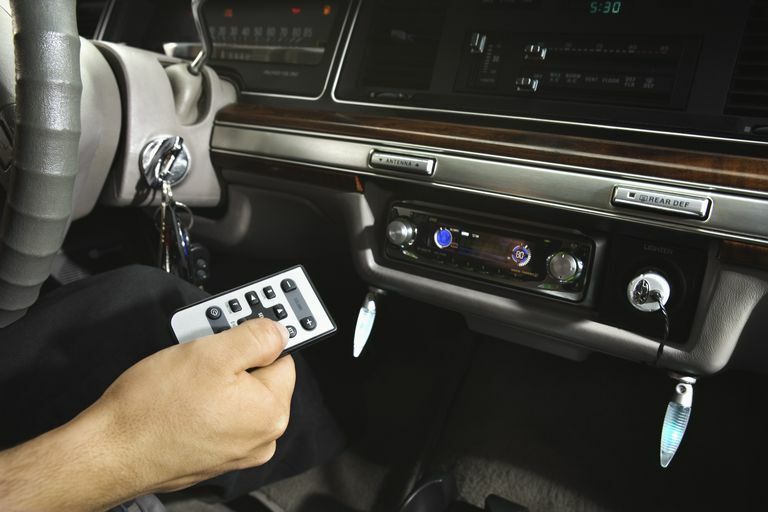 FM transmitters and decoder boards often come with remote controls, so you don’t have to fiddle around with tiny, inconvenient controls, but this still isn’t as convenient as simply using the built-in controls on the head unit that supports USB natively. Some head units even have other advanced functionality, with direct iPod control, when connected via USB, which is something that you can’t mimic with an FM transmitter or MP3 decoder board. If you’re looking for this type of functionality, then upgrading your head unit may be more satisfying in the long run. The other issue is that USB car stereos can sometimes charge devices like phones and MP3 players in addition to providing a data connection, which is a functionality you are less likely to find in an FM transmitter or decoder board. While it is possible to add this functionality as well with a 12V USB adapter, adding a hard-wired USB power port to a car is a different operation altogether. What Can You Do With a Car Radio USB Port?